PRI-G is super concentrated; one quart treats 512 gallons and is a complete fuel treatment that improves any type of gasoline, enabling it to perform to maximum potential. PRI-G’s industrial strength, enhanced thermal stability chemistry reacts with fuel upon contact, and provides multiple benefits: Engines perform better and last longer Engine power increased and fuel economy realized Fuel stays fresh months, even years Hesitation, knocking, and pinging reduced. 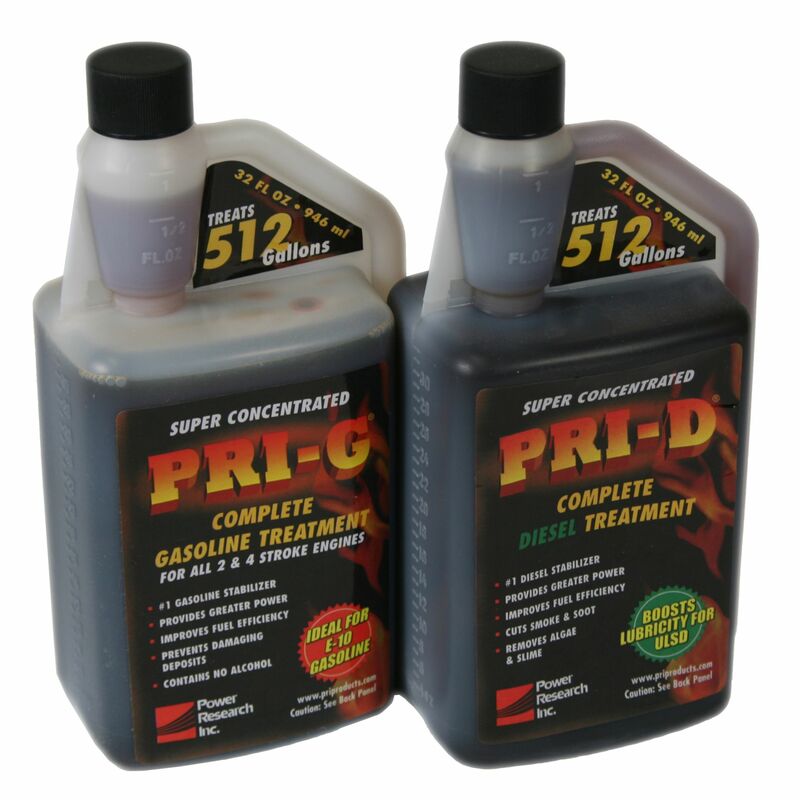 PRI-D works chemically within diesel fuel to improve the combustion process. Improved combustion means improved engine performance. You will realize increased power from your engine. At the same time, you will enjoy greater fuel economy. PRI-D is also extremely effective at reducing harmful emissions, including smoke opacity, NOx, and SOx. PRI-G works chemically within all gasoline to improve the combustion process. Improved combustion means improved engine performance. You will realize increased power from your engine. At the same time, you will enjoy greater fuel economy. PRI-G reduces the hesitation, knocking, and pinging that is common in gasoline engines. It is also extremely effective at cutting harmful emissions. Smog tests are no longer a challenge. PRI-D & PRI-G is a highly effective preventative maintenance tool. PRI’s proprietary, refinery-grade chemistry is unsurpassed at preventing carbon deposits and fuel system fouling. Your engine will remain cleaner and last longer. In addition PRI-D formula assists in eliminating the tank slime and sludge that diesel fuel users commonly encounter! Properly treated fuel will stay fresh in storage for months and even years at a time. Tests have shown PRI has gone a step further, actually restoring old fuel to refinery-fresh conditions. If you are storing fuel for any period of time, you can’t afford to be without PRI. PRI is super concentrated, treating fuel at a 1:2,000 ratio. This means PRI is extremely cost effective to use. Get the most out of your fuel for only pennies a gallon! PRI's enhanced thermal stability chemistry works within the fuel instead of altering it, which means the product is completely safe to use. PRI-D contains no potentially damaging Cetane improvement additives or harsh solvent chemistries. With PRI no fuel specifications are changed, therefore PRI meets all major engine manufacturer fuel specifications – warranties are not voided! Use PRI today to get the most out of your diesel fuel and your engine. This product has been used by industrial fuel customers for years, although not widely known in the consumer market it is the best fuel treatment available no matter the price. Many here at BatteryStuff.com have personally used both the PRI Diesel and Gasoline treatments since 1993 and have never encountered a fuel related problem in any of our equipment since that time. We feel that one of the greatest assets of PRI Fuel Treatments is the long term fuel storage and the ability to recover old stored fuels. If you have used Power Service or Lucas you will find that PRI is a far superior product and less costly per gallon to use. Super Concentrated - treating fuel at a 1:2,000 ratio. Safe To Use - With PRI no fuel specifications are changed, therefore PRI meets all major engine manufacturer fuel specifications – warranties are not voided! Do you own the PRIDG64oz? Please, tell us what you think about it. It helps us provide you with better products. Please note that it may take up to 72 hours for your review to appear.